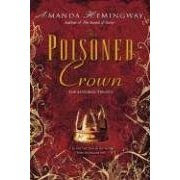 Nathan, hero of the prior two books, has a third and final treasure he has to recover, the Poisoned Crown. But what will happen when all these other-world relics are in one place and time? Does Nathan really know what is going on? Since this is the third in a trilogy, I'm not going to get any more in depth about the actual plot; but the links below point to reviews that offer more specific details about the plot of this book. You should read the books in order. This is the conclusion of a trilogy; and while it works fairly well as a standalone, there is a lot going on that a reader won't appreciate without the benefit of reading the first two books. What I really like about this trilogy is that it's like reading one book in three parts, rather than three connected books. The author also wrote the Prospero's Children books under a different name (Jan Siegel). In this book I noticed crossovers with that series: Atlantis, Ragginbone, Kal (Kaliban). I'm not sure if there were crossovers in the other books or not, but it's interesting to have this all occur in the same universe. The ending changes everything. It was so "wow" that I want to reread from the beginning with this new perspective. I'm almost hesitant to say anything more than that, because I want you to be as surprised and impressed as I was. What else can I say without giving away too much? As in the other books, Nathan has a quest for an object of power; it involves multiple worlds; it involves bad guys in multiple worlds; and we discover more of his heritage. The Arthur parallels regarding his parentage continue; and are not romanticized. Nathan dreams of other worlds; sees their problems and learns more about his quest; and then dreams himself into those worlds, where he both finds the object and helps people solve their problems. It's a bit Gary Sue of him; but isn't that what a teen would think? "If only I was there to make them listen to reason," Nathan thinks, just as book reader or TV viewer would. But then Nathan actually gets to go to the world of his dreams and act; to befriend those he has watched in dreams, to share the knowledge he had from viewing all sides of the story. And since he is the hero, of course it works out for him. And this appeals to the reader, who wishes to have that power also. Casting Nathan as the Gary Sue in the worlds he explores is a deliberate choice, that both lulls the reader into thinking the story is one thing... when it's something quite different. And as I look back, I wonder what Nathan's real job was in the other worlds; and what his choices meant to the overall trilogy I love that something that seems simplistic means much, much more. Who is Nathan? What is his role? As one character says, "Plainly, Nathan has a vital part to play, presumably as a gatherer of certain objects. He has already retrieved the Grail, as you have heard, along with the sword." I also liked the humor: "When you have spent half the night partying, and the other half in a potentially disastrous confrontation with the forces of evil, there is nothing like the prospect of a good breakfast." And there are a tone of pop culture references ("live long and prosper") along with wordplay and myths, such as as Scarbarrow Fayre. I also liked this bit, a musing by Annie, Nathan's mother, after someone says that so and so tried and that's all one can ask. "Trying isn't enough, Annie [Nathan's mother] thought unhappily, after she left Bartlemy [Nathan's protector]. He's right. Sometimes trying just means I'll make an effort to show I'm willing, but it doesn't matter if I fail." Yet, as Annie notes, sometimes you have to do more than try; you have to actually succeed. Thanks for the link. I loved this series, too. And you're right - Michele should read it! I also love the character of Annie and her relationship with Nathan. I like that they have parent/teen conflicts, and yet they clearly love each other. The both try very hard with their relationship, yet they both make mistakes. Overall, I think the characters are one of the strongest things about this book. And you're right that the ending does change everything. The whole series, and especially this book, seems to be leading to one thing and the ending is unexpected. Yet there are clues in the book if you go back and look. I hope I haven't said too much, because, like you, I don't want to spoil it! Dear gods ! I'm feeling ganged up on !